Insomnia : A powerful REST API client with cookie management, code generation, authentication for Linux, Mac and Window etc. HEAD Same as GET, but transfers the status line and header section only. HEAD method is identical to GET except that the server MUST NOT return a message body in response.This method is often used for testing hypertext links for validity, accessibility, and recent modification. As shown in the above table, there are a couple of ways to update attributes in a resource. You can update a resource with PUT or PATCH method. Now, the question is When to use PUT and When PATCH? For instance, when updating a single field of the Resource, sending the complete Resource representation might be cumbersome and utilizes a lot of unnecessary bandwidth. In such cases, the semantics of PATCH make a lot more sense. Basic Authentication : The most simple way to deal with authentication is to use HTTP basic authentication in which the username and password credentials are passed with each HTTP request. Token Based Authentication: For multiple API calls to the appliance, it is recommended to use this approach. In this approach, client requests a token for the username and password. Then the token is used instead of username and password for each API call. Query specification identifies the controls available when querying collections. While querying, we can specify control attributes in the GET URL as value paris. There are three main techniques comes under query specifications. Let’s take a look on them. Paging : In this capability, there are two attributes available as offset and limit. Offset means first item to return and limit means the number of items to return. A good place to troubleshoot is to look into standard log files under /var/www/miq/vmdb/log on the CloudForms appliance. All the api related logs are recorded under /var/www/miq/vmdb/log/api.log. In order to dig deeper, changing the level of log is much recommended. 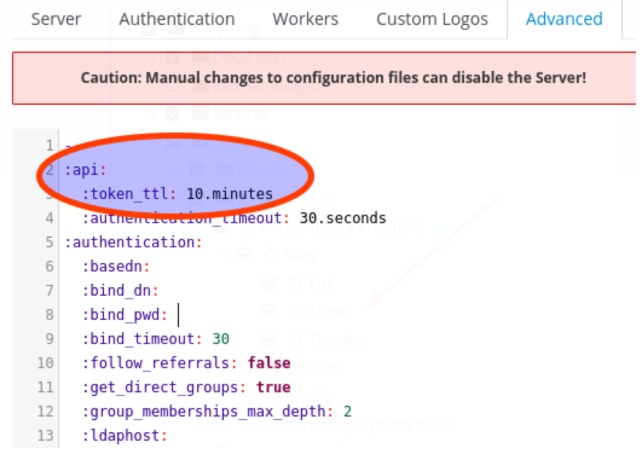 You can change the log level by navigating to Configuration → Server → Advanced → :level_api: debug. I hope after reading this article you will get basic understanding about how CloudForms can be managed via REST API’s. You can find the full Rest API documentation here.